The Tucson Museum of Art is holding its Spring Artisans’ Market this weekend, March 17–19, featuring more than 100 of the Southwest’s best artists and artisans. Come find that something special while you and your family enjoy great food, craft brews, blacksmithing demonstrations, free admission to the museum, and more! I will be in Booth 16 (the booths have been renumbered), which is right next to my usual spot, in front of the blue wall on the east side of the museum, catercorner from Old Town Artisans. The show runs from 10 a.m. to 5 p.m. on Friday and Saturday, and from 10 a.m. to 4 p.m. on Sunday. The museum is in downtown Tucson at 140 N. Main Ave. 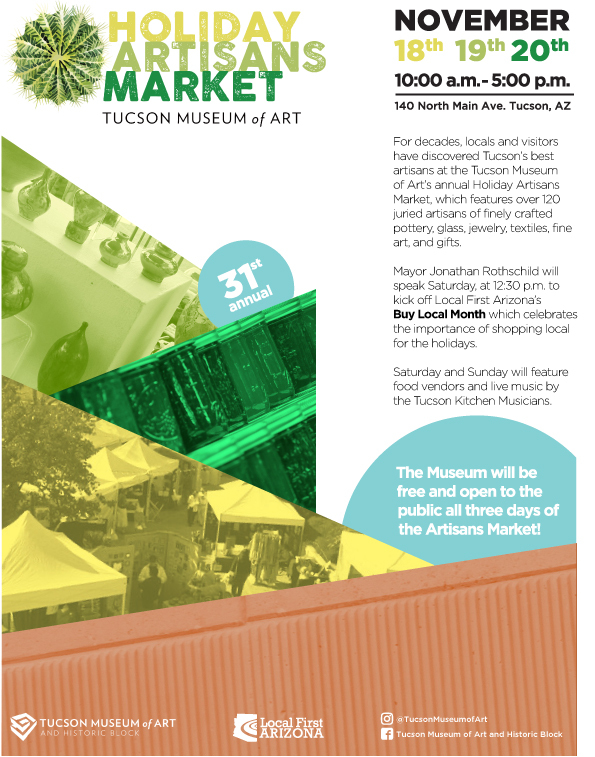 The Tucson Museum of Art is holding its Spring Artisans’ Market this weekend, March 18–20. More than 100 of the Southwest’s best artisans will have set up shop in the museum’s courtyards. Come find that something special while you and your family enjoy great food, craft brews, live music, children’s activities, free admission to the museum, and more! I will be in my usual spot, Booth 104, in front of the blue wall on the east side of the museum, catercorner from Old Town Artisans. The show runs from 10 a.m. to 5 p.m. Friday, Saturday, and Sunday. 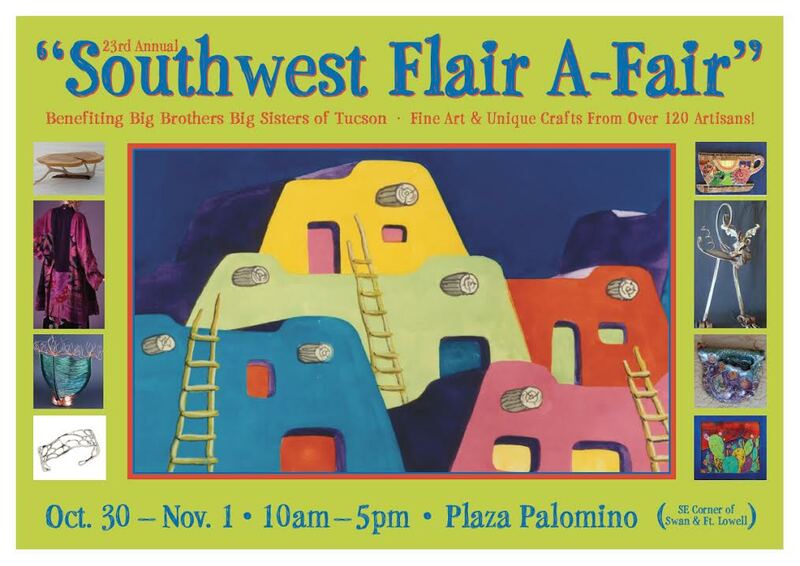 The museum is in downtown Tucson at 140 N. Main Ave.
Big Brothers Big Sisters of Tucson will host Southwest Flair A-Fair, its 23rd annual arts and crafts show, this coming weekend, October 30th to November 1st, from 10 a.m. to 5 p.m. Friday, Saturday, and Sunday. More than 150 of the region’s finest artisans (including me, natch) will showcase their arts and crafts at Plaza Palomino (at the southeast corner of Swan and Ft. Lowell Roads). Come enjoy a weekend of beautiful fall Tucson weather and art! A portion of the proceeds from every piece sold will benefit Big Brothers Big Sisters of Tucson. I will be in Booth 86, in the east parking lot.